Under the guidance of an expert team of trained conservators the Ottoman Hammam (bath house) on Kastellorizo (located near the Castle of Knights of St John) is presently undergoing an extensive restoration process which is expected to be completed in August, 2016. Click here to read more. Donwload the Hammam Restoration PDF here. Again, under the guidance of an expert team of Protection of Monument architects and engineers the working bench in the Municipal Agora on Kastellorizo underwent restoration works in June, 2016. 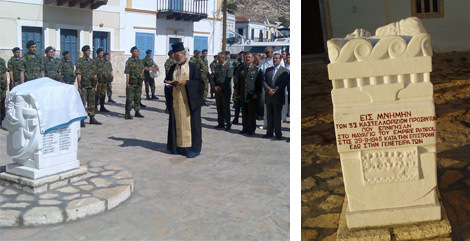 The unveiling of The Empire Patrol memorial took place on 13 September 2010 (Independence Day of Kastellorizo). It was a fitting tribute to the people who lost their lives on the 29th September 1945 (For more information about the disaster visit www.empirepatrol.com). The visiting military band played a sombre hymn at the unveiling followed by the Greek National Anthem. In his speech the Mayor of Kastellorizo made special mention of the financial assistance received from the ‘Friends of Kastellorizo‘ towards the commissioning of the memorial. In this regard, AFK acknowledges the generous donations made by its members, Emanuel Foundas, Christos Christodoulou, Dr Paul Boyatzis and the Mitaros Family. The sculpture by resident artist Alexandros Zygouris bears the names of the people who lost their lives in the disaster. It is carved from a block of beautiful white marble about 90 cm high and about 50cm x 50cm (placed on a plinth about one metre high) and is located on the harbour of Kastellorizo, near Aghios Giorgos tou Pigadiou (St George of the Well) church. Restoration of the Windmill and Passas Wells is being investigated and contact has been made by Friends of Kastellorizo with the Archaeological Society in Rodos to assist. This project will involve the appointment of a suitably qualified Archaeological Architect to present a restoration project on behalf of Friends of Kastellorizo.